This weekend I received an invitation for a ship inspection aboard the brand new Holland America Eurodam! What a ship she is! 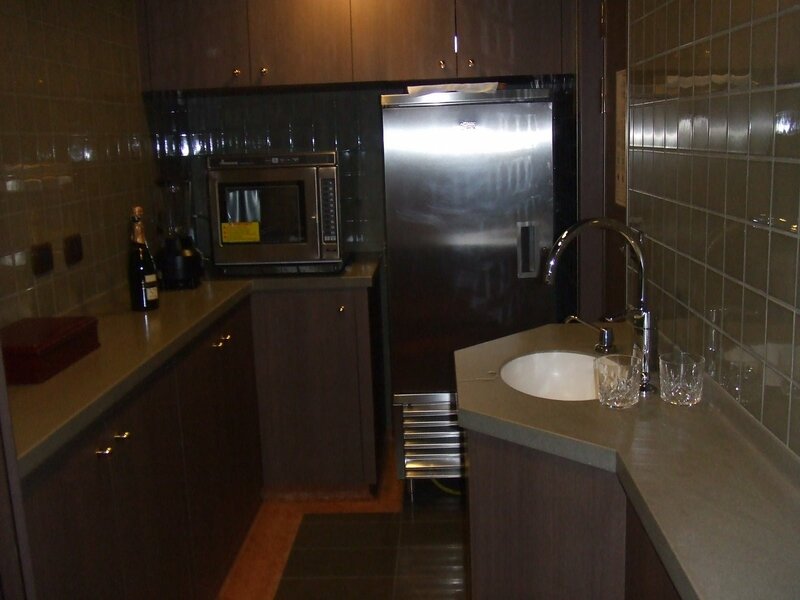 I have to say I was very impressed with the contemporary design and sophisticated elegance. 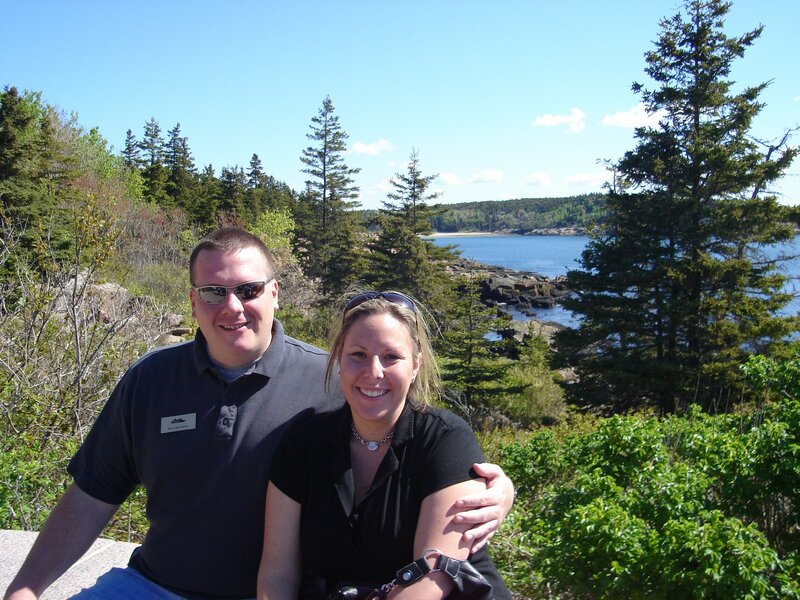 It was larger than Holland America Lines’ other ships yet still as traditional and intimate. I wish I had more time to truly experience all that she had to offer though I did manage to get a “taste”. I say this quite literally as Holland America treated us to a fabulous lunch in her main dinning room. This was quite a treat and much larger than my usual lunch consisting of 5 courses and wine. 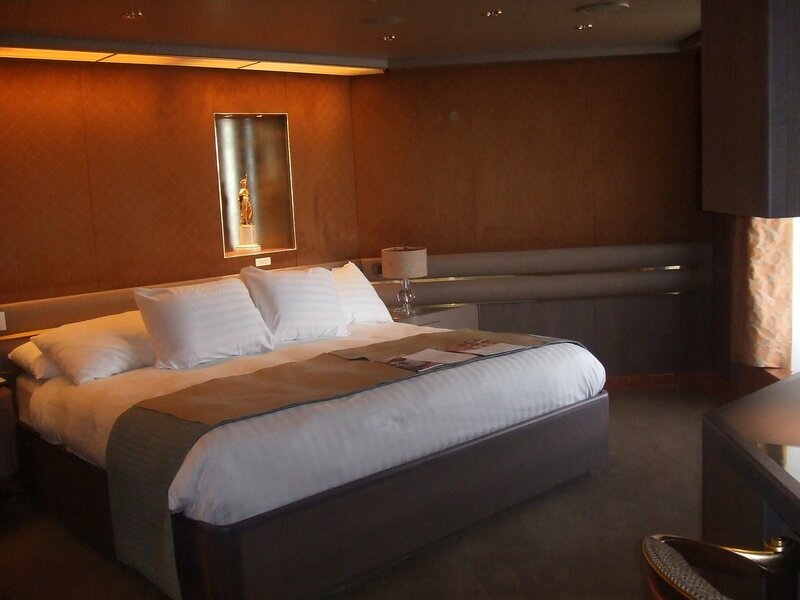 I will start with the cabins as I toured my way from the Penthouse cabin down the standard inside. The penthouse was quite the sight. As you enter the cabin you pass the butlers pantry which would be used to host dinner party served course by course or a cocktail party with your friends and family. The living room has a table for 8 and a large sofa that sleeps two. The living room was quite comfortable and had flat screen TVs throughout. 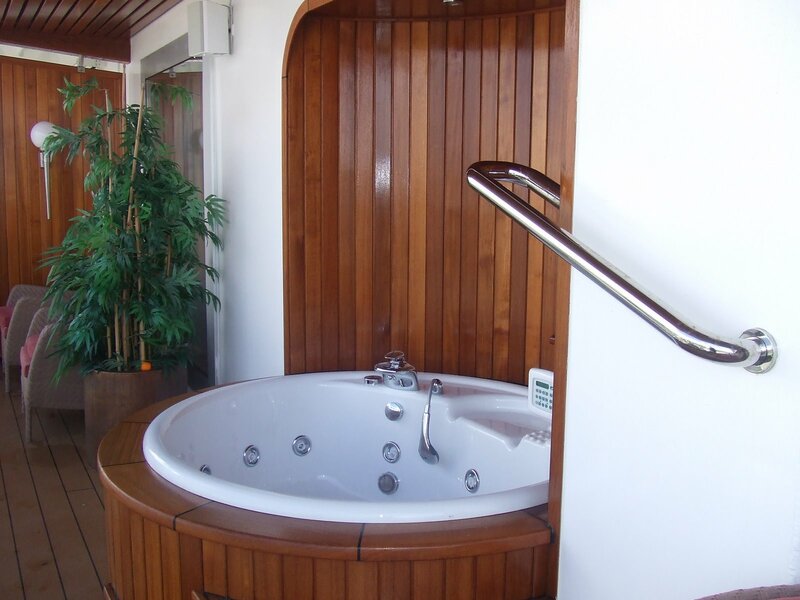 There was a door to the very spacious balcony which brought me to the outdoor Jacuzzi. That had to be the highlight of the cabin for me, as I would sit out there quite a bit. What a treat to be able to sit outside in my private balcony in the Jacuzzi while sailing the Mediterranean! They had two bathrooms, guest and master. The master bathroom had a split bath and it was gorgeous! There were lots of gold furnishings and even a tub with a fountain shaped like a lion. The next level down was the Deluxe Veranda Suite. 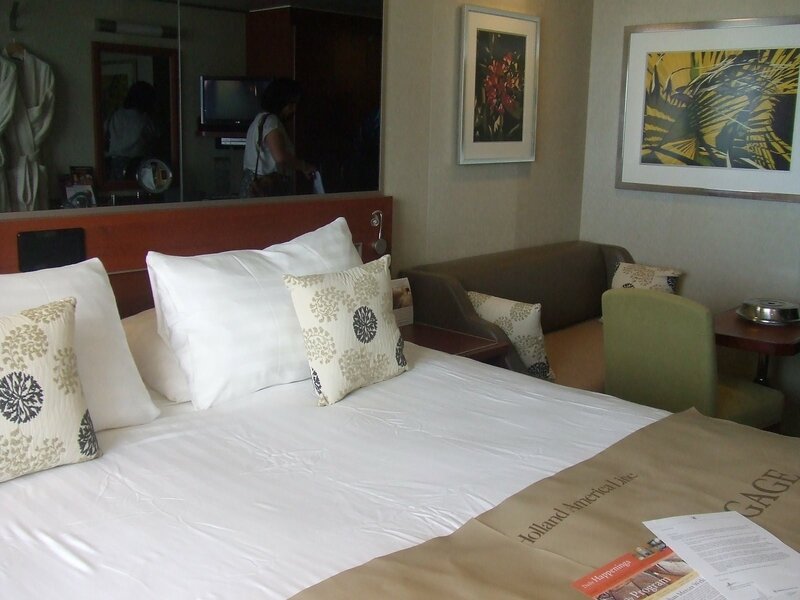 I highly recommend this category stateroom as it does provide a substantial list of extra amenities, among them the priority embarkation and the Neptune Concierge Lounge. 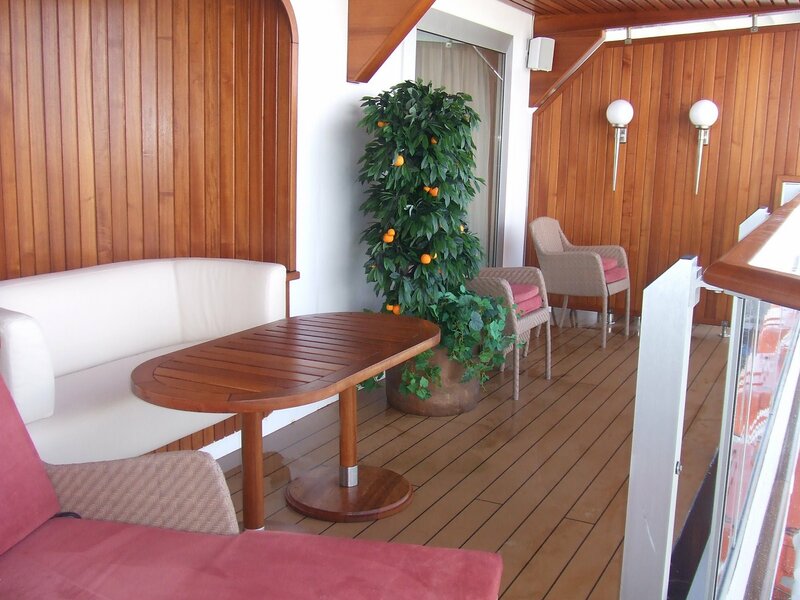 As I boarded the ship I saw a separate area just to facilitate the boarding of the Deluxe Veranda Suites and above. This makes the process stress free with shorter lines and fewer crowds. 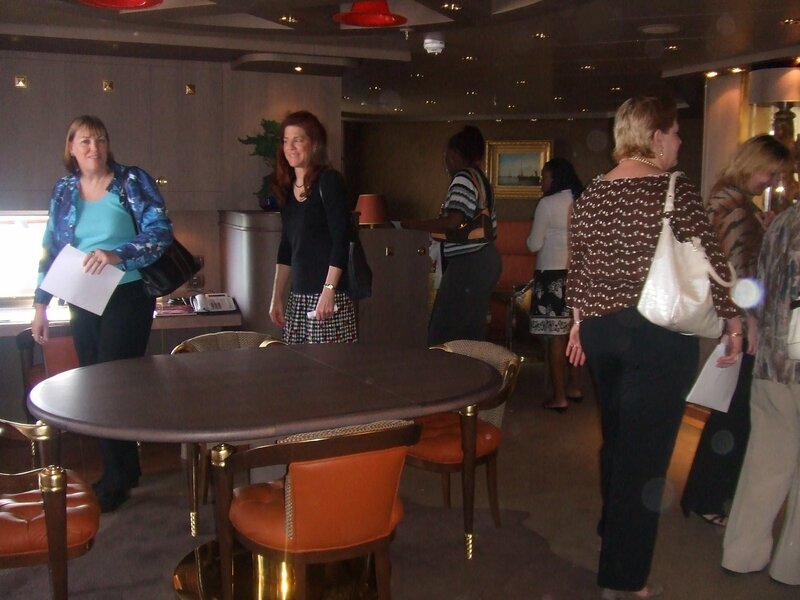 Once these guests get on the ship they may stop by the Neptune lounge to meet the concierge and have a drink and hors d’oeuvres. Some other wonderful benefits to being in a Deluxe Veranda Suite is the complimentary laundry. 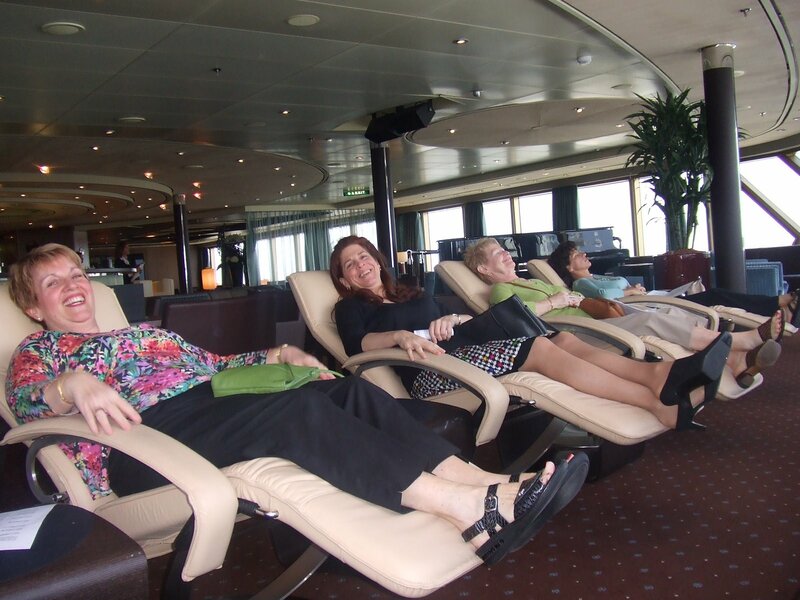 When cruising with my husband we certainly take advantage of this amenity. By having our laundry done throughout the cruise we don’t have to pack as much and can go home with clean clothes while not having to do laundry later myself. As for the cabin they came with a large wrap around couch and terry robes and towels. The veranda was a nice size and had wicker chairs with soft cushions and a foot rest. 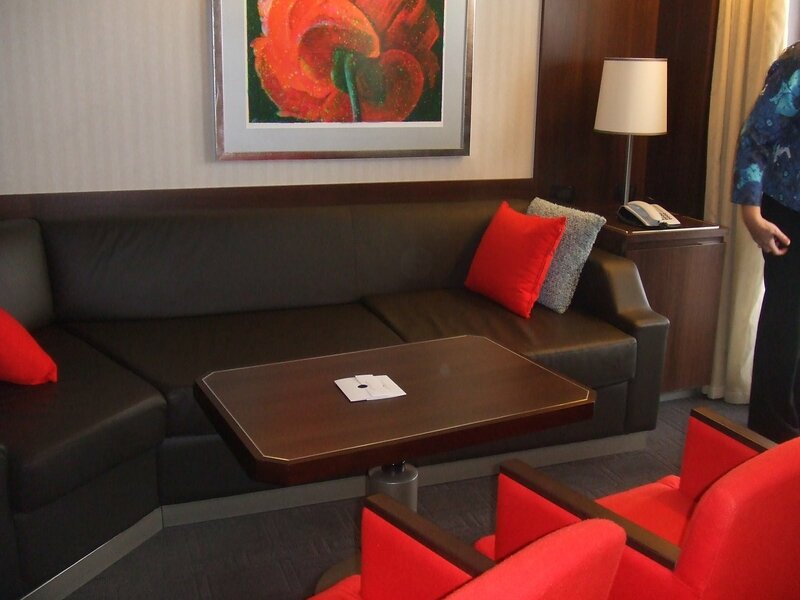 I liked the colors of these new cabins and the couch was very comfortable and fit in very well with the décor. The Superior Veranda Suites were also very nice, though a slight drop in size from the Deluxe Veranda Suites. Most of the difference in size seemed to come from the living room area where they replaced a wrap around couch with a smaller couch that sleeps one. The Deluxe Veranda Ocean views are slightly larger than a standard balcony with a love seat in the sitting area across from a vanity. The interior stateroom comes in two sizes and if I were to be forced into an inside cabin I would definitely chose the larger stateroom as it has a decent size sitting area. 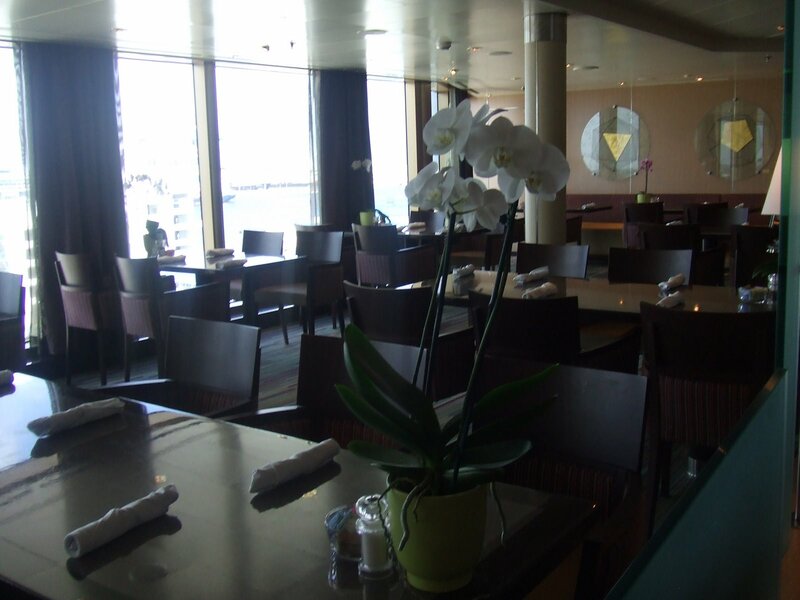 Now moving along to the public areas of the ship…..I just loved the culinary arts center. I have seen it on their other ships, but this one was just fabulous! 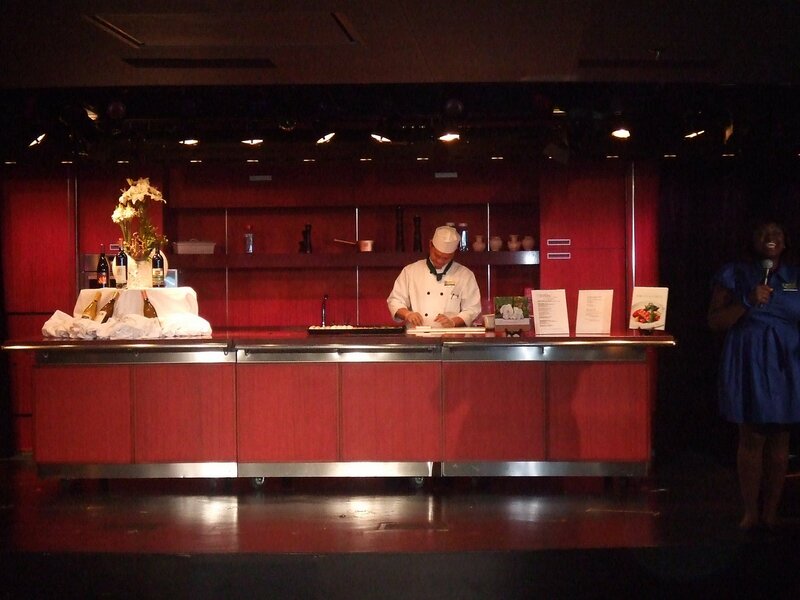 They have culinary demonstrations as well as other classes such as towel folding. Since I am a total movie buff, I was very excited about their screening room. It had a very large screen and the most comfortable reclining leather seats. Speaking of very comfortable seats I would have to say Holland America has the most comfortable seating in their Crows nest and Explorations Café. 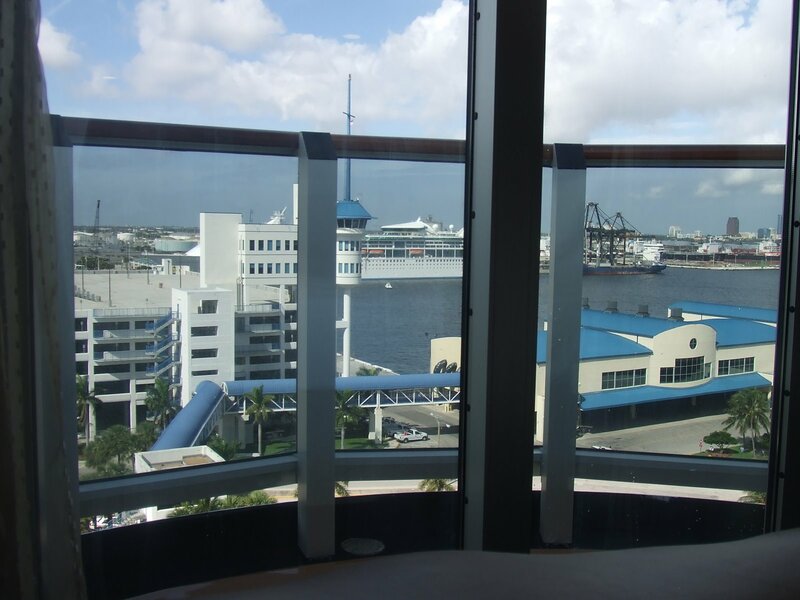 Something that they tried on the Eurodam that is different from their other ships is putting the Explorations Café up where the Crows Nest is, giving you a great view while you sip your latte and read a book. On to my favorite part….dinning! The buffet on the Eurodam has a very special restaurant called Canaletto which is a reservations only Italian restaurant which is complimentary for all guests. Tamarind Restaurant and Silk Den Lounge is their new Pan Asian Restaurant and lounge with panoramic views of the ocean and Lido Pool area. Sadly there was no time to try this restaurant but it will be top of my list when I cruise on her for a regular sailing. 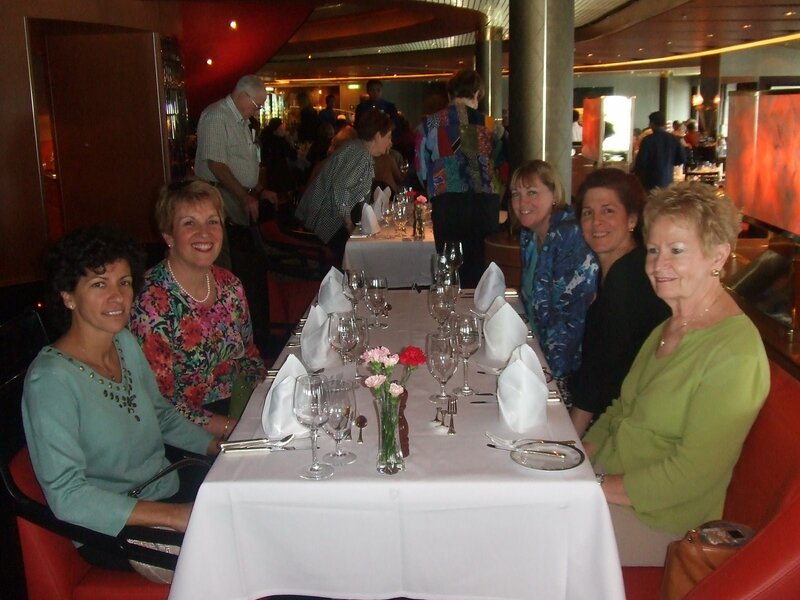 The main dinning room was where Holland America was gracious enough to serve us lunch. I had the duck pâté, seafood chowder, mahi mahi with rice and vegetables and a fabulous fruit pastry for desert. I can surely say I left the ship full! 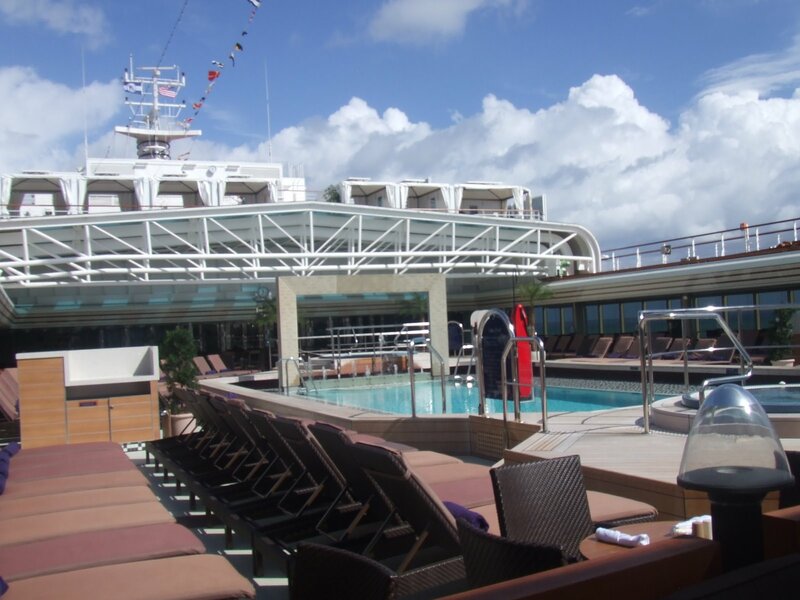 Something new that Holland has done on the Eurodam is add new poolside cabanas. 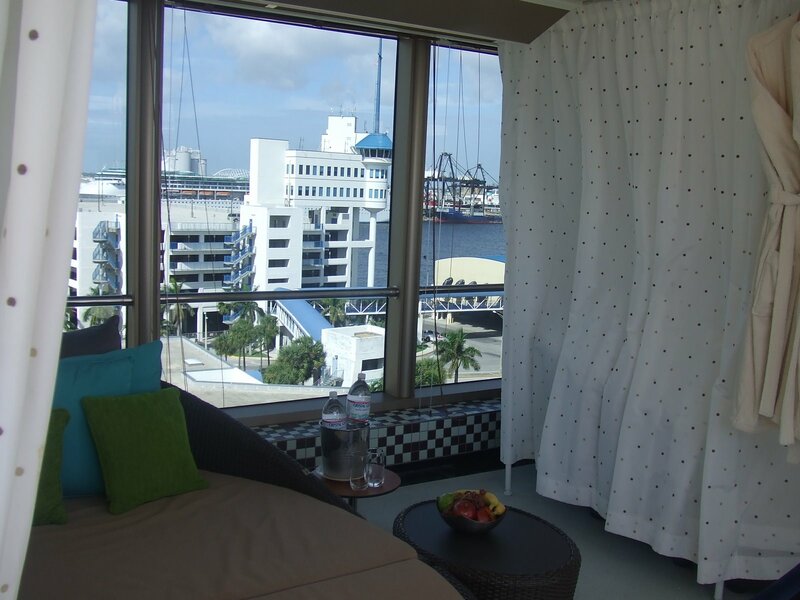 The cabanas are available to reserve by the day or by the cruise. 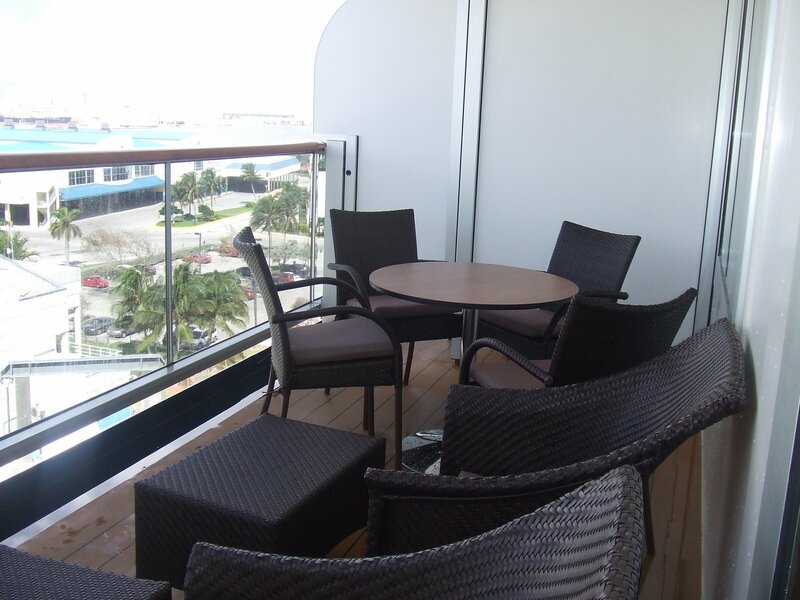 Available on two decks, they are tastefully decorated, filled with amenities and provide an exquisite poolside retreat. The Retreat is your own private oasis located high above the rest…the ultimate place to relax surrounded by healthy refreshments and luxurious amenities. Well I think that about sums it up. 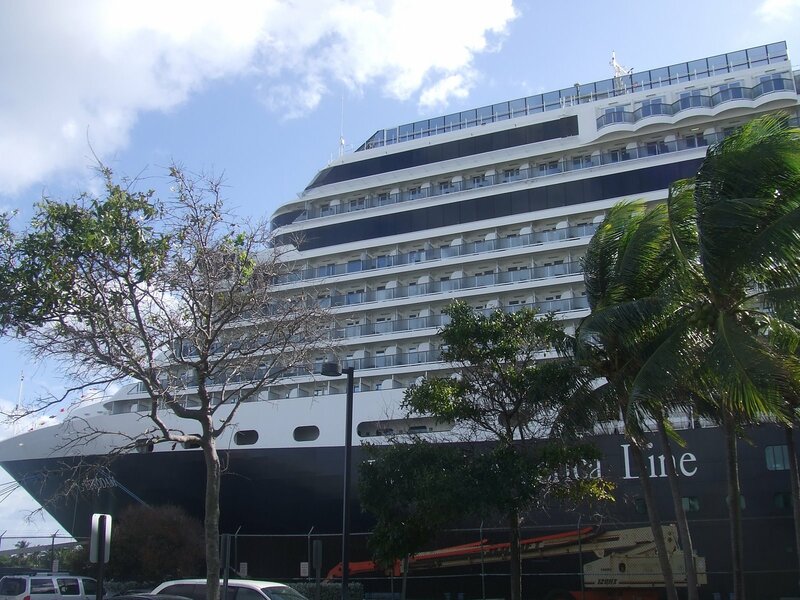 I hope you enjoyed reading about my day on the Holland America Eurodam. I will give this ship a big two thumbs up!